Nano Towels can replace your paper towels and even cleaning products to save you money while also saving the environment. ⚠️ Double-check the price at checkout as the offer may end at any time. Everyone uses paper towels in their kitchen. They’re great for cleaning up those small spills and accidents every kitchen faces. Unfortunately one thing they aren’t good for is the environment. The production of paper towels uses up a lot of trees and even more water. Not to mention that when they decompose paper towels release methane, one of the leading causes of global warming. That’s where Nano Towels come in. Nano towels use only water and can replace all of your paper towels and even some of your cleaning products to save you money while also saving the environment. 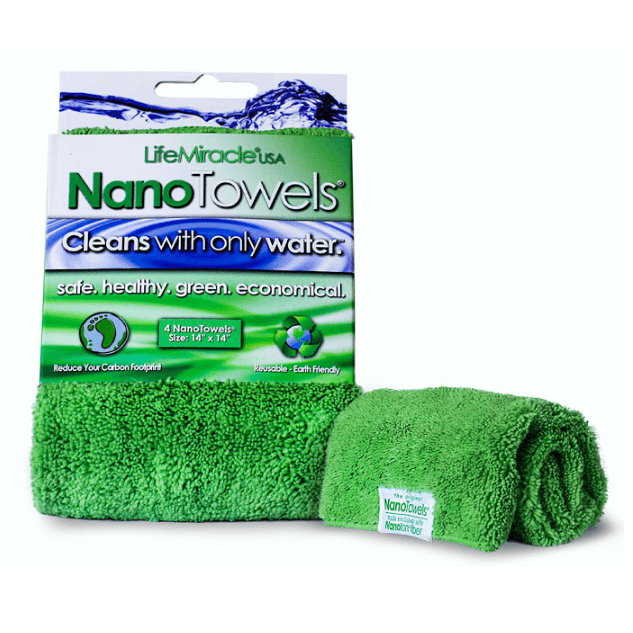 Nano towels pick up liquid, dust, dirt and grime and they can do it all without using any toxic chemicals. They cut down on your paper towel reliance and consumption and can collect up to 10 ounces of liquid all by using water. They’re made of a revolutionary new fabric called Nanolon Fiber. Water Liberty, the company behind the nano towel, works in partnership with Trees for the Future. They plant a tree for each purchase made at Water Library; including nano towels. So you’re giving a little extra boost to the environment in the form of more trees just by making a purchase. Nano Towels are available in packs of 4 or 8 towels and two towels (one damp one for cleaning and one dry one for dusting and wiping) can handle most household tasks. They only need water to clean wood, stainless steel, glass, and many other surfaces; all of which would usually require the use of a chemical substance. They’re great for dusting, washing your counter tops, floors, bathrooms, glass; you name it they can clean it. As they’re so soft they are also great for washing cars as they don’t damage the paint and can take on a lot of water. While Nano Towels do get dirty, just like any other towel, they can be washed and reused. That pack of four towels can last you for a long time. One Nano Towel by Water Liberty lasts for around three years or 300-400 uses and each towel comes with a 1-year guarantee. Think of how many paper towels you use in a year and how much you spend on them. Nano Towels can do all of that (and more) for a fraction of the cost. It’s also possible to still use chemical cleaning products with your Nano Towel if you really want to. But try them without chemicals first because it really could be enough. You can also use Nano Towels with the tried and tested natural cleaning product that is simple baking soda and vinegar. Nanofiber is also an entirely different product from microfiber. Don’t get the two mixed up and think that microfiber is going to do the same job. It won’t. Microfiber is great but it can only get you so far. Nanofiber is brand new and state of the art. Comparing microfiber and nanofiber is like comparing a VHS to Blu-Ray. If you’ve tried microfiber and been pleased with the results then you’ll love what nanofiber and Nano Towels can do. Six Pack Secret™ Discount – $20 Off! These things are so awesome! They really work! These towels are amazing – much thicker than typical cloths. Love these towels! They work GREAT on every thing I have tried!